Seeing an artist in action is a rare treat. Especially, a painter. 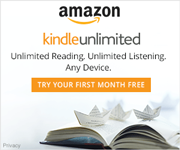 One of my friends and faithful readers is also a talented artist. 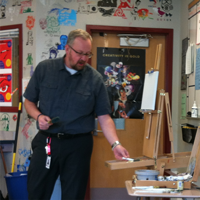 Mike, who is the assistant principal at our school was a guest in the art class across the hall. Not as the assistant principal doing assistant principal stuff, but as a guest artist doing artsy stuff. 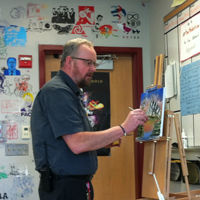 In fact, Mike created a whole painting in less than a class period. If you have ever seen a Bob Ross show, Mike’s painting was similar in some ways. 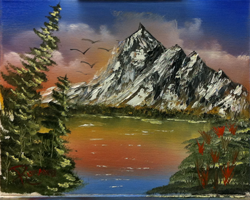 In fact, he referenced the late Bob Ross as one of his teachers. A teacher from the TV or internet as it were. 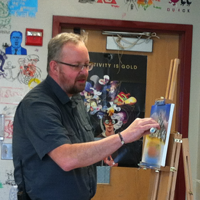 Mike talked about the concept of wet on wet painting and how to put on paint on the canvas in such a way as to make sure colors that you want to mix actually mix to form the color you want, and how to paint on colors that you do not want to mix. It was very instructive and I am sure the students got more than what they bargained for. One of the things that Mike did that I do in my classes is tell stories. He told stories about his paintings. He even had a slide show going behind the painting he was doing. The slide show showed many of his works, which he said his mom loved. All but one, that is. There is one and only one painting that Mike’s mother does not like. He showed it and then told the kids why his mom did not like it. There was the potential for disaster in the reason, but the students were so mesmerized that they did not catch the reason it could have been a dicey subject, or they were so mature that the reason was not controversial or inappropriate at all. Either way, the stories were relevant and entertaining, and we all know why Mike’s mom does not like the painting of the red dress. I do not know how he did it, but Mike actually talked and painted. And painted and talked. He told stories and taught the kids who might not even have wanted to learn anything. And when all the stories and all the teaching were done, Mike had a finished painting. I do not remember anybody saying a word unless it was to answer Mike’s questions. Maybe it was that I was mesmerized, but I do not think so. The class period went by in a flash. And what was once a white canvas was a finished painting. I always knew my friend, Mike, was a fantastic teacher. And I knew he was a great painter too. 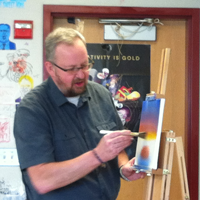 I am just glad I got to experience the teaching painter in action. Seeing Mike paint in real life was a rare treat that I will remember and enjoy for years to come.